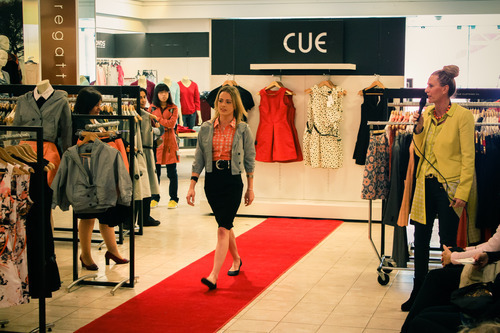 Cue continued to shine with colour bursts at Myer on Friday. 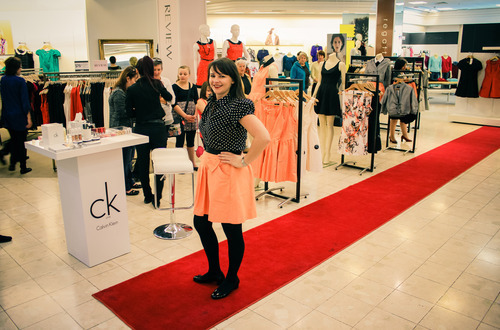 A second workshop was held instore to celebrate the launch of their fresh Spring collection. Final outfit prep. Citrus twin set…tux jacket and polka dot, long-line shirt dress. I went for a smaller, snug size, to wear it as a long top. A larger size would be looser and a little longer and could be worn as a dress. Alternatively, it can be unbuttoned and worn as a vest. 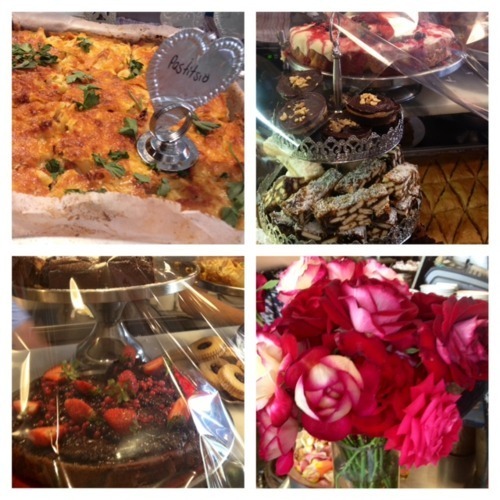 A versatile piece…now that’s nice! Design Studio neon choker, exclusive to Myer. Tuck one side in, to add interest and to expose the belt buckle. 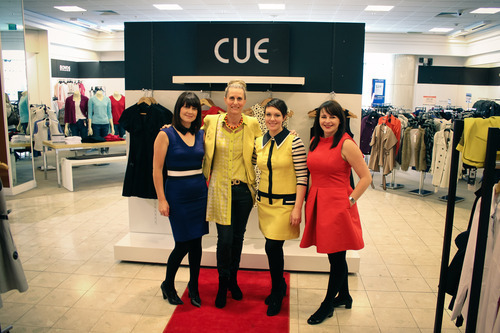 Before we showcased the new designs, I shared a little Cue history with the crowd. It’s a sentimental journey for me, as I remember buying my first piece of Cue, way back when I was a new grad teacher. Many were amazed that it’s still a true blue, Australian owned family company. Rod Levis began Cue back in 1968. He’s still very involved and along with his son, flies to Europe each season to source exclusive fabrics from the very best mills. 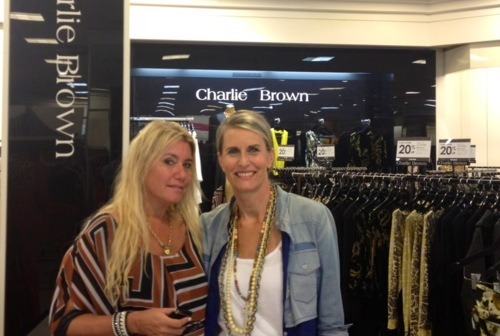 They design clothes for the modern, fashion forward woman and most of the garments are made in Australia. Cheers to that! The show’s in full swing and the audience love it! Dafny is perfect in peach and polka dots. Trend alert. Sharon added a Cue detachable collar to her outfit. Sinead (above L) from fabulous make-up house, ck one, gets busy with a mini make-over. Petite Jemma, ‘relaxed’ her office attire, with a cute checked bomber and pumps. 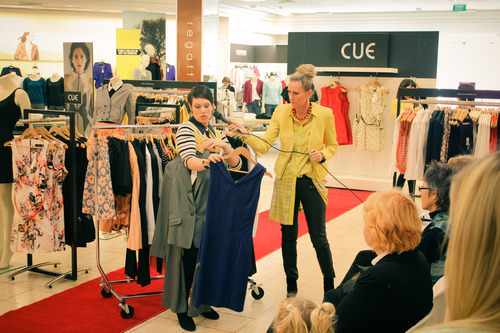 Cue State Trainer, Lorene, showed us how to mix and match suits with dresses and high-lighted their unique design features. 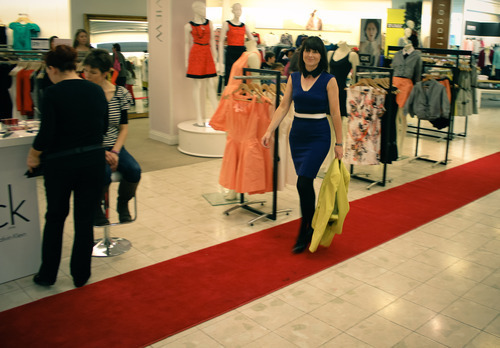 Daf rocked the runway in red! Love her upbeat vibe. Workshops using real UnModels, seem to wow the crowd. Everyone admires their courage. Claps and cheers abound. It’s all about stepping up and having a go. The Cue Team above, did their company proud. Congrats girls!